GG Pender is an R&B singer-songwriter born and raised in the Lower 9th ward of New Orleans, Louisiana. She started singing in church at the tender age of three and was known for her soulful and sultry alto voice. She always knew that she possessed a God-given gift to sing and write. As a child, her family moved after Hurricane Katrina and relocated to Montclair, NJ. There, she joined Montclair High School and immediately joined the Chorus Group as a form of therapy to deal with the grief and anxiety she was feeling. She wrote a song entitled “I Cry,” the song won her the prestigious High School Grammy Award held annually at Pace University. The song was recorded in the world famous, Jimmy Hendrix Studio in Manhattan. In 2008, she graduated from the highly competitive Montclair High School with a 4.0 GPA. Although she had a choice to enroll in a number of Ivy League Universities, she attended Clark Atlanta University in Atlanta, Georgia which was her dream school from the age of 12. Through it all, however, she maintained her dream of singing professionally and found her voice through singing and writing music. She is a firm believer in Jesus Christ and declares Him as the foundation that she stands on; her faith has given her the platform she has now to sing and affect change in a world that is consumed with so much negativity. GG is influenced by industry heavy weights : Whitney Houston, Lauryn Hill , Mary J Blige and Aaliyah . 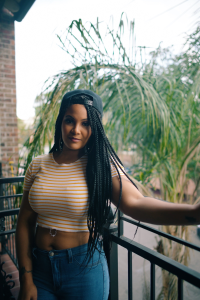 She has worked with producers such as Gussy Corleone from Chicago, New Orleans/Atlanta singer Casme’ and many other entertainers. She has written and performed vocals on several hip-hop and R&B songs between 2016 and 2017. Pender is poised for a breakout year with the release of her single “UNO” (pronounced You Know) and her upcoming full length EP.